Home » Blogs » Charles Gaba's blog » Connecticut: Weighted avg. *requested* 2016 rate increase revised downward to 7.2%? Some of the Anthem plans subject to the hearing are sold through the state’s health insurance exchange, Access Health CT, while all the ConnectiCare and Golden Rule proposals that will be reviewed during the hearings are sold outside the exchange. Anthem is seeking to raise rates by an average of 4.9 percent for its plans, which have 34,553 policyholders in the state. ConnectiCare is seeking a 9.8 percent increase to plans with 34,000 policyholders, while Golden Rule proposed an 18.5 percent rate hike for plans that cover 2,000 policies. Anthem and ConnectiCare initially proposed different average increases but adjusted them after Access Health raised the fee it charges insurance plans to fund its operations. 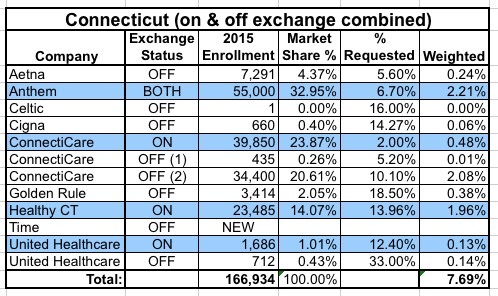 Anthem appears to have reduced their request from a 6.7% increase to just 4.9%, while ConnectiCare has gone from 10.1% to 9.8%. I'm not sure what to make of that, really; if I have this correct, it's certainly good news, but it doesn't make much sense to me given the fee increase. Anyway, assuming have it right, between the reduced requests and the slightly-shifted market share figures, this means that the overall requested weighted average increase has dropped from 7.7% to 7.2%. This could drop even further after the public hearings, although it's also conceivable that the regulation board could increase the rates as they did in Oregon recently.